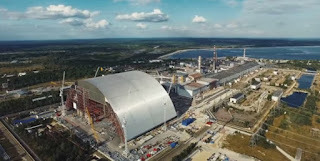 Spectacular new footage shot from a drone flying over the site of the Chernobyl nuclear power plant released by the EBRD today shows the latest advances in securing the site of the 1986 accident. The video focuses on the arch that will shelter the damaged reactor 4 upon completion in late 2017. It will prevent the release of contaminated material from the present shelter and protect the structure from external impacts such as extreme weather. 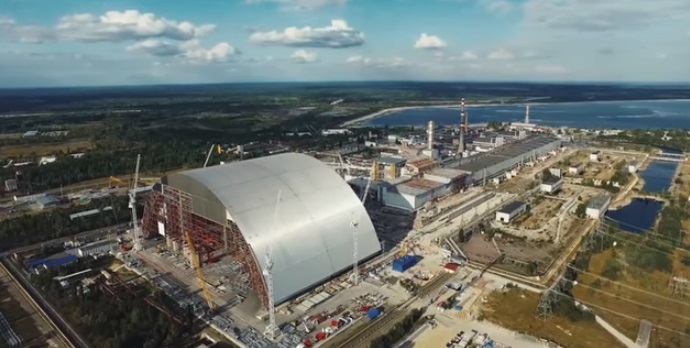 The New Safe Confinement is the largest structure ever been assembled in the vicinity of a heavily contaminated site and is 110 metres high, 165 metres wide and 260 metres wide. It is being constructed by the international consortium Novarka, led by the French companies Vinci Construction and Bouygues Travaux Publics. Novarka also commissioned the drone video. The construction works on site started in late in 2010 and recently passed another milestone when the two halves of the giant arch were joined. Once fitted with state-of-the-art equipment for deconstruction the structure will be slid over the damaged reactor, making it the largest moveable, land-based structure ever built.